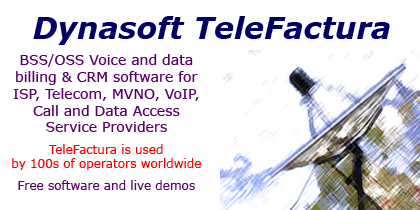 Dynasoft TeleFactura is the definitive BSS OSS convergent telecoms voice, data, voip, billing and Radius server solution for telecoms operators, callshop resellers, office service operators distributing telecoms services. Managing 1000s of voice or data end-users has never been so easy. Hosted and outsourced services are offered to mitigate investment costs. TeleFactura offers two main versions: TeleFactura Billing with advanced billing and reporting features to bill database-driven or text-based CDRs and TeleFactura Engine, a Radius/AAA server to give full telecoms engine capability with the following functionality: * CLI and MAC address-based authentication * Configurable multi-session concurrency control * Authentication, Authorization and Accounting management * Session handling * Collection of all accounting information and usage statistics * Exporting of all accounting information into the billing or other systems * Management of user accounts for all services * Detailed real-time traffic collection made available to the billing of users. The main reporting features (offered by both versions) include: * Carrier provisioning, account reconciliation, inventory, mediation and call rating * Secure Web portal for customers * Extensive number of configuration options so your market needs are matched as closely as possible * Clear, easy-to-use set of interface for all customers, resellers and supplier carriers * Referral system between customers * Extensive rate sheet options * Create Least Cost Routing lists with advanced options * Full-featured database or text-based Call Data Records (CDRs) rating * Auto-sending of invoices by email * Email alerts * Built-in FTP tool * Data replication * Data backup * Automatic CDR retrieval * Supports MS Access, MySQL and MS SQL Server * 350 financial reports * SQL-based data export utility * Advanced commission system for service resellers * QoS analysis * Full pre/post sales training and support * Distributors sought worldwide.